A man – filthy, stinking, alone and obese – is taken in by the police. We don't yet know what he's done, or why he's there. But he's going to tell us his story. 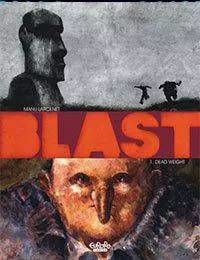 The story of a man who strives to live by his own rules, free from the bounds of socially imposed morality and norms, an ambition inspired by one blinding, ecstatic, vivid moment of ultilmate perfection in life and existence – The Blast. He makes the only choice possible for him after such an experience: he leaves everything behind and sets off to live, really live, in the wild, on his own. This first volume is a homage to the acute beauty of nature, solitude and feeling alive. And to the pain and brutality necessary for this man to find his way to another, purer, more complete level of existence. But is the mysterious ‘Blast' really what it seems? And so the interrogation begins.